In the 60’s, Indian cinema witnessed the arrival of Tarzans and stadium king wrestlers with a big bang. Azad, played Tarzan in over a dozen films and entered the Guinness Book of World record for acting as Tarzan in the most Tarzan movies. 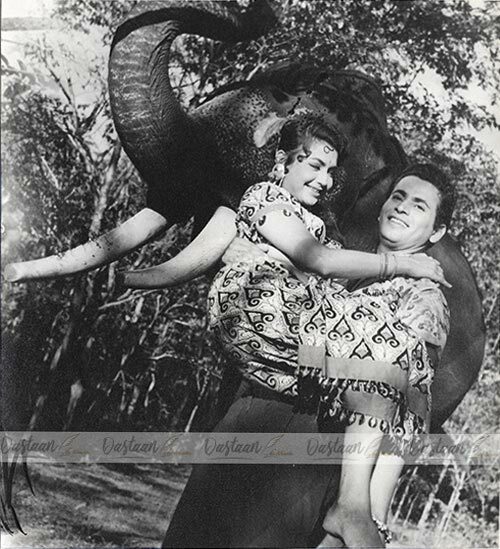 His macho Avatar could be seen in movies like Elephant Queen (1961) with Helen in the lead. Kamran too joined the league of the muscle Men and swept the leading ladies of their feet in films like Wrong Number (1959) & Chalbaaz (1969)..
What these men presented to the audience was unprecedented. They showcased muscle power and thus started a trend a lifting & carrying their lady loves around in the movies.